Installing home siding is a practical way to breathe new life into your older home, and it’s also a widely popular choice for new home construction. In fact, more than ever, home siding offers many advantages than other home cladding for aesthetics and longevity. 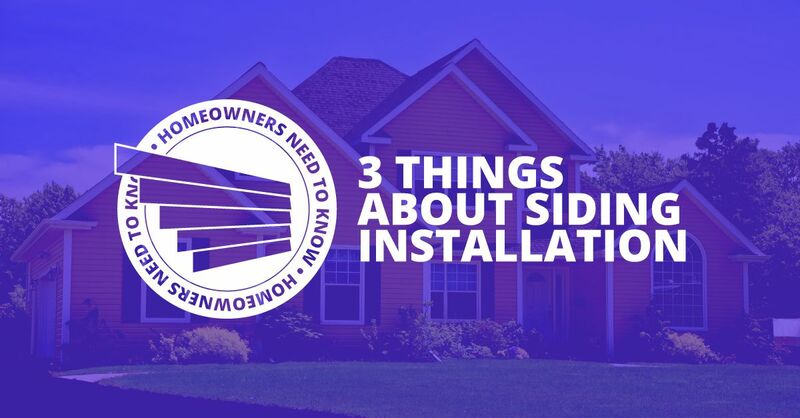 If you are thinking about installing siding for your Sacramento area home, the following are three things to consider. As a responsible homeowner, you want to choose the home siding that best suits your designer eye and your budget. You may also be concerned about using materials that are more environmentally friendly. The following siding materials and brands are sure to serve your needs. DuraTemp: DuraTemp by Roseburg is plywood siding with a 1/8-inch outer layer of real Douglas fir laminate — an extremely hard surface that resists damage from hail and other elements. DuraTemp’s appearance is similar to cedar and offers a beautiful real-wood, natural look. James Hardie Cement Board: Cement board and shingle siding by James Hardie is created using a patented method that offers superior durability and a wide variety of styles. The 30-year warranty is top-of-the line, too! LP SmartSide: This siding is an engineered wood product that offers the look of real hardwood siding. It may be stained or painted, and offers excellent protection against the elements and insects. T1-11: T1-11 siding is available in two different grades — plywood or oriented strand board (OSB). Both offer a practical siding option. For more finishing options, choose the plywood grade. Installing home siding gives you the opportunity to boost your home’s energy efficiency. You’ll benefit with greater comfort and lower utility bills. Rigid insulation panels increase the R-value (i.e., resistance to heat transfer) of your home’s shell, reduce air infiltration and provide a smooth surface to apply the siding. Talk to your certified siding installer for your best options. When you choose a siding material, you are also choosing the amount of maintenance and upkeep you will need to perform through the years. For example, if you decide to stain your siding to highlight the wood aesthetic, it’s recommended to apply a coat of protective stain every 3 to 5 years. If you paint your siding, you can wait 10 or 15 years to repaint, or sooner to change the color. For quality siding installation that you can count on through the years, contact Straight Line Construction today!